All my stationery nerd friends said, “Read this book, you’ll love it.” Well, I have and I don’t. When I spot a factual error in a book it makes me question all other information held as facts in the book. The first factual error I found was on page 26 where Ward states that reed pens are “filled by pouring ink into the top of the pen.” Apparently Ward has never used a reed pen because this is hilariously wrong. Reed pens are dip pens. You soak some reed pens (bamboo) in water before use to activate the capillaries in the bamboo, but even still they are still dip pens. They function similarly to quill and steel dip nibs.. You dip them in ink. After this point I was left wondering what else was wrong. 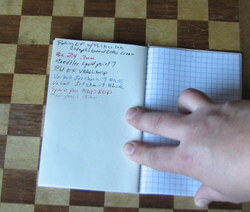 In the section about Moleskines he writes that the “first” time a moleskine was labeled as “Made in China” was only after the company had been purchased by SGCapital in 2013. I suspect this may be a typo and he meant 2003, which was certainly before Modo e Modo was purchased. Further I remember the online uproar the “Made in China” label created. 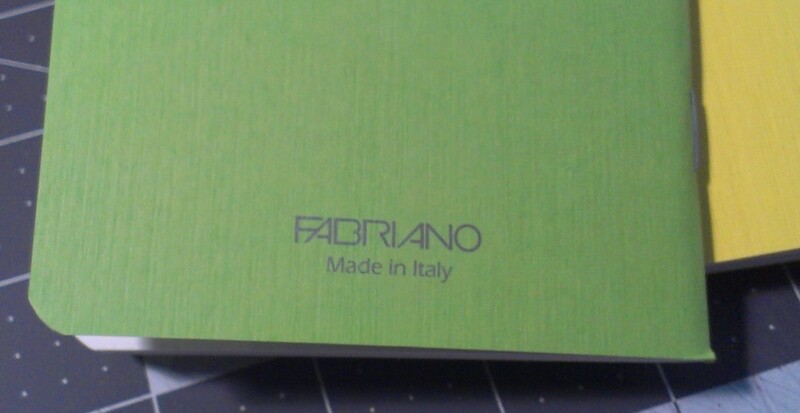 I remember my first “Made in China” Moleskine. I got that Moleskine long before 2013. 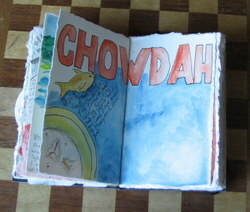 In fact 2013 is long after I’d given up using Moleskines due to quality control issues. It is true that the Moley had always been made in China, and had previously been labeled, “Designed in Italy.” Further I have some issues with his “historical” facts of small-m moleskines. Yes there was one Parisian supplier that sold those made by someone Chatwin loved, but moleskines are a style of small pocketable notebooks- not just the one sold in that one shop. Rather, moleskine was used to describe all manner of small pocketable notebooks covered in oil cloth and were available all over Europe. After this point I began to hate read the book. The section on pencils is quite good, though I’m reticent to take anything he’s written as factual given the previous factual errors. The section on King’s The Dark Half may not be totally accurate. Ward’s humor is not funny to me. He tries really hard to be pithy and funny but often his jokes fall flat. Where Rees has deadpan down pat Ward’s attempt at humor fall flat and scratching my head, wondering how did he think that was funny? I got what he was trying to say, I just never found the humor in what he had written. Frankly, Ward’s writing style bores me. I’ve read many of the books on his reference list, and while those are boring they are far more informative than Ward’s book and because the writing was solid, well researched and informative with out wannabe pithy commentary, they were good. I’m sorry, but The Perfection of the Paper Clip is anything but perfect, and I can’t even say it’s good. I’m not including an Amazon link for this one. just because I tortured myself doesn’t mean you should too. This entry was posted in Reflection, Review and tagged clip, James Ward, paper, Perfection, shite on 20170219 by leslie. If I were new to the pen, pencil, and paper addiction and reading the top blogs right now I’d be convinced that entering into this addiction might be very very expensive. As much as I love to read about pricey pens, I know that many are out of my reach. It seems to be a rare occurrence for an affordable pen to be flogged. A notable exception is the Pilot Metropolitan, a pen that I like very much but wasn’t overly enamored with, but still recommend for people looking for a starter pen. Another thing that makes pencil-dom more affordable is that pencils and paper pair up more easily. 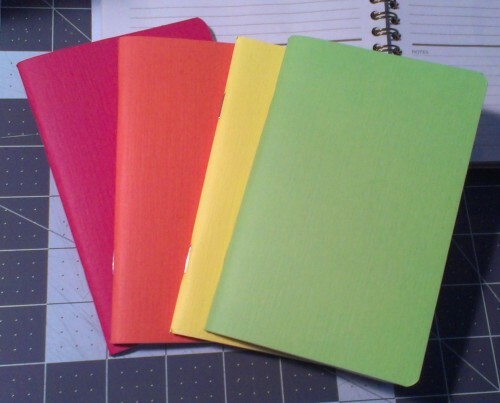 I have a stack of journals and notebooks I’ve put aside because they didn’t work well with my fountain pens. Many of these are doing great with my pencils but were horrible with fountain pens. 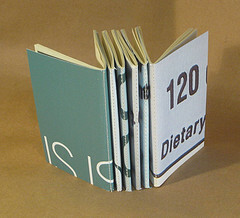 Take for instance the Martha Stewart and Avery pocket notebooks. God awful with even a dry writing fountain pen but great with a pencil. In fact with a pencil they shine. the paper doesn’t chew up the pencil, but is toothy enough to get a lot of graphite on the page without crazy smudging. I still wouldn’t recommend it as a primary pocket notebook because it’s got those nasty perforated pages, but for quick notes or short letters, it’s great. Every time I pick up a pencil it writes. 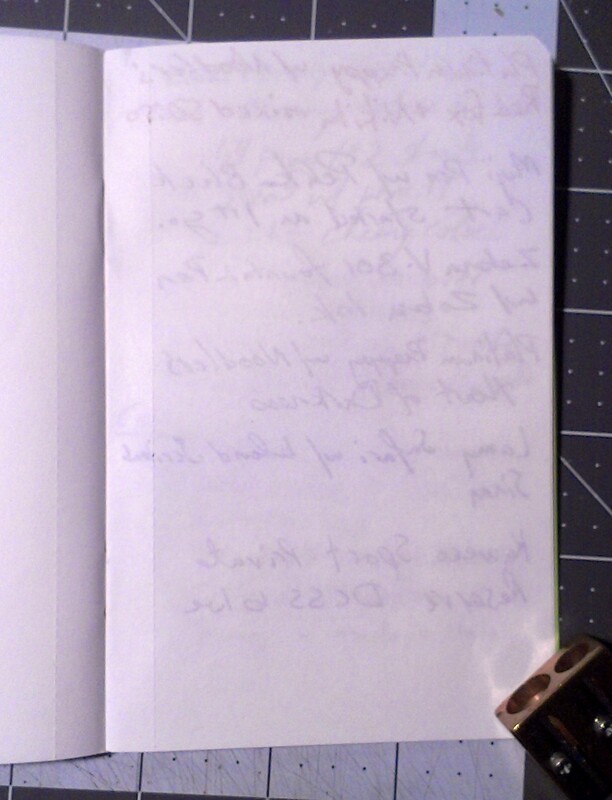 Occasionally a point will break off and I’ll have to sharpen it, but generally speaking, I get graphite on the page. That isn’t always the case with a fountain pen. Sometimes the ink will need coaxing out of the nib, sometimes it needs water to be added, or I nee dot refill it , or flush it, or something. If I’ve used a pen consistently it will write without issue, but man if you let that sucker sit for a month you are in for some work. Of course there are exceptions to that rule. I’ve got 2 Platinum Preppy pens sitting on my desk. I haven’t touched either one in over a month. 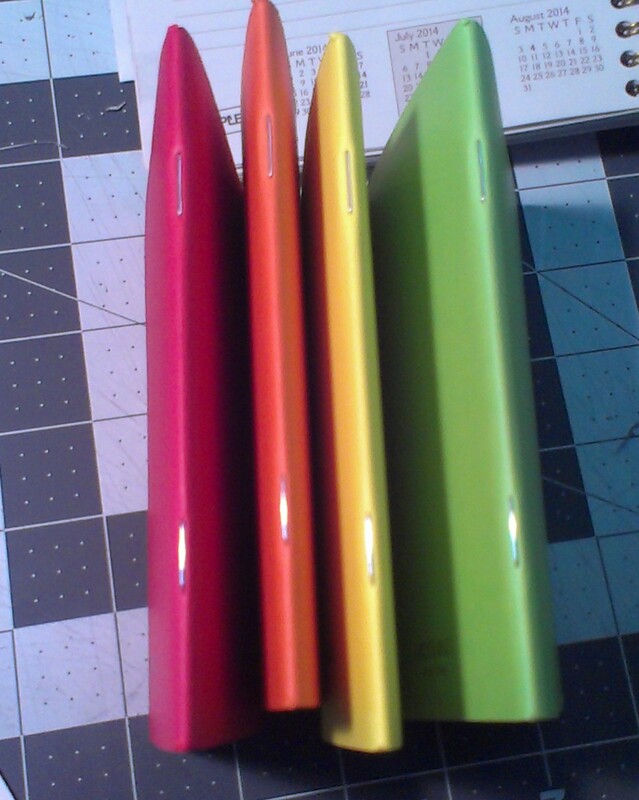 One is loaded with red ink and another with black. Both of them wrote without a skip or issue. My TWSBI 540 or Lamy Safari can’t say the same thing. One of the reasons I’ve been reviewing pencils this summer is that for the most part, pencils are affordable. even the most expensive pencil I’ve reviewed/ purchased was $2.50. Compared to my most expensive pen at $75 that’s a bargain. Getting into pencils can be done with just a few dollars. A decent writing experience can be found for $2.50 for a dozen pencils (USA Gold Naturals) and an exceptional experience can be had for $20 a dozen (Palomino Blackwings, pick any one of the 3). I’m not suggesting that pencils are better than pens, simply that they have a lower expense for greatness. This entry was posted in Inspiration, Journaling and tagged cost, expense, fountain pen, paper, pen, pencil, pencil vs pen on 20140701 by leslie. 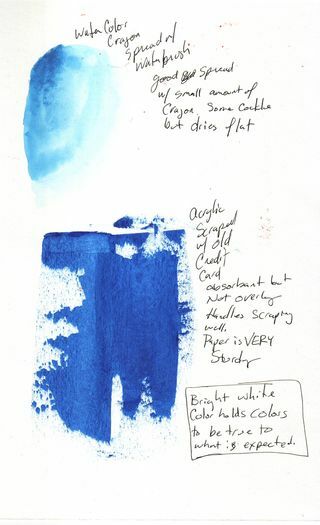 I picked up a Canson XL 30 sheet pad of CP 140# watercolor paper a few months back with the intent of comparing it to my favorite inexpensive paper, Strathmore 140# CP 400 series. It compares well. 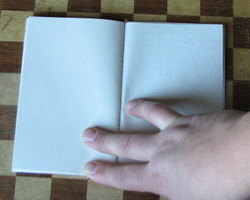 First off, it comes in a glue bound pad which is good for bookbinding not good for art journaling. To me a glue binding is temporary and won’t last, I abuse my art journals and thus this pad would absolutely not hold up to my use. The paper folds in half easily and without cracking. 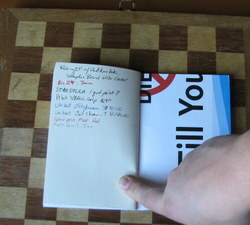 This is a bonus if you are intending to make your own sketchbook or journal. 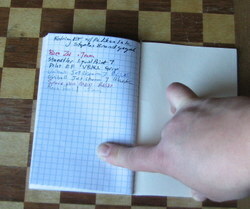 The grain of this paper is along the short side, which again, is perfect for binding. The paper is thinner and softer in feel to other 140# paper, specifically the Strathmore. It’s still stiff, but is not quite as stiff as cardboard. The cold pressed paper is textured more on one side than the other. The Canson CP is significantly less textured than most other CP papers I’ve used, and I’ve used a lot. The reverse size is significantly smoother than the front. You can feel and see the difference in texture. The amount of sizing is different too. The differing texture and sizing means that when binding you either let the different textures face each other OR you pull the pages out and face them together. 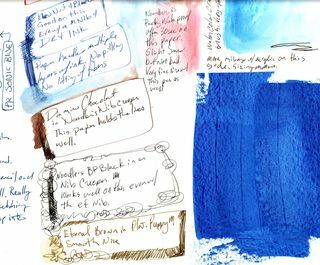 It’s an extra step in binding that makes an art journal more pleasurable, versus getting into the journal and realizing each facing page responds to pen, ink, and watercolor differently. I find that annoying. The paper handled ink like a dream. Even my fine and extra fine pointed fountain pens floated on its smoothish CP surface. Noodler’s bullet proof ink bonded with it well and other inks gave me a wonderful watercolor effect. The pages handled watercolor crayon like a dream and scraped acrylics like it was made for it. I noticed even with repeated brushing and scribbling layers of ink no pilling or pulling up of fibers. Either side handled them well. The reverse and smoother side was much more absorbent, so an even pull of credit card scraped acrylic got less coverage but was decent. The paper is heavy enough that I did not notice any wrinkling. Watercolors of course gave a cockling effect that soon relaxed as the paper dried. This is a budget friendly pad of paper. I purchased it on sale for around $7; regular price is around $13 for the 11×15 in size. 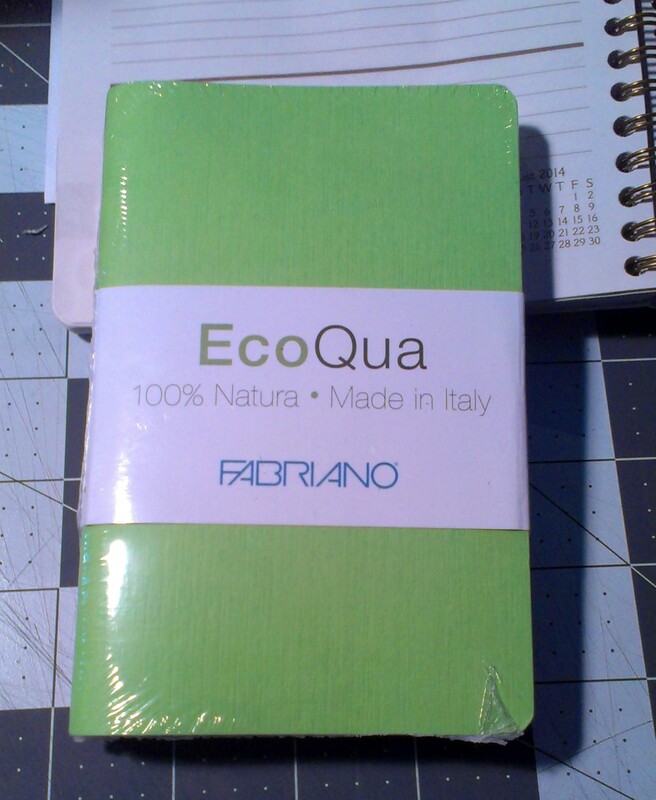 It’s not a bad price, especially for a pad that is easily folded up for making an art journal. I found it on Amazon (see below) for $4.59 in the 9×12 size, which is not bad at all. I was unable to find the 11×14 on Amazon but did find it on the Blick site for about $7. 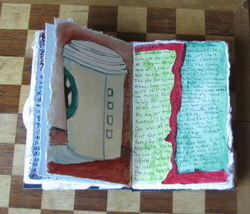 This entry was posted in Review and tagged canson, draw, paper, sketch, sketchbook, watercolor, XL on 20110113 by leslie. These jotters almost didn't make it to Artfire. I'm so in love with the shades of green on the covers of these notebooks these almost remained mine.IF I didn't already have a box full of jotters these would have been mine. My loss is everyone's gain 'cause they are on ArtFire here. You can also follow the link to the images of these on Flickr and see more pictures of jotters and other notebooks. This entry was posted in Uncategorized and tagged diary, jotter, journal, notebook, pad, paper, plain, sketchbook, unlined on 20090623 by leslie. So I tested the 3 papers I wrote about in my previous post here. The first paper I tested was Staples brand 65lb coverstock. It’s thick, stiff and smooth. It’s quite enjoyable to write on, accepts all inks well without noticeable feathering or strikethrough. 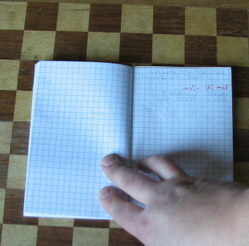 The next paper was the Staples brand 5 squares per inch graph paper. As much as I don’t like to sew it up into a book I was surprised at how much I liked writing on it. The paper is very lightweight, very smooth and takes ink well. 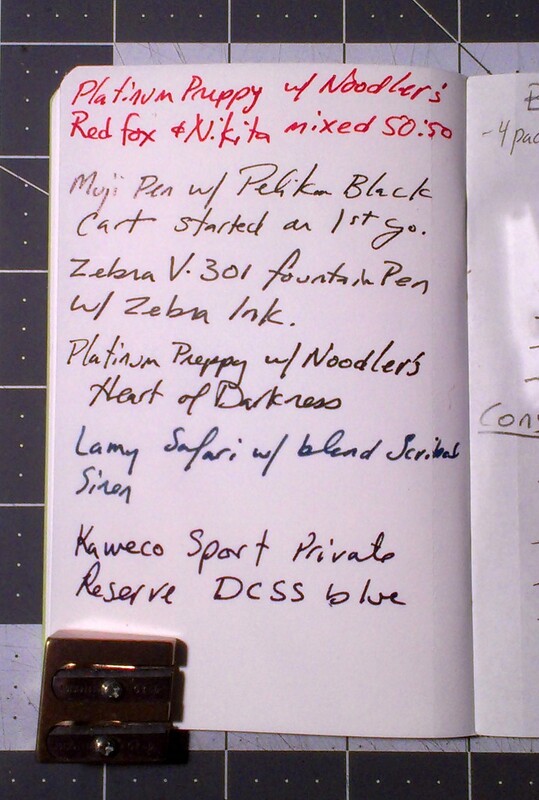 I noticed a little feathering with the fountain pen and the Staedtler liquid point. There was also a lot of strike through with most pens, however the following pens showed little to no strike through- Uniball Jetstream- all colors and the space pen. The thicker pens with more liquid ink had more strikethrough. The next paper was the Staples brand 20lb paper in cream. I found little strike through on the paper with the exception of a red liquid ink pen in .7mm. I should check it out with a thicker fountain pen and see what happens. Again I was pleasantly surprised at how nice this paper was to write on. While not the same experience as a Strathmore 100% cotton it as a very nice feeling paper with all the pens. 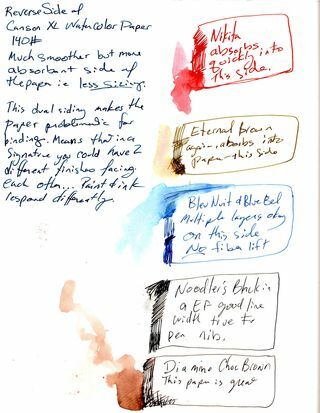 The fountain pen ran smoothly over the surface and the more fluid inks didn’t feather, with the exception of the red ink, which gives even the thickest of papers trouble. 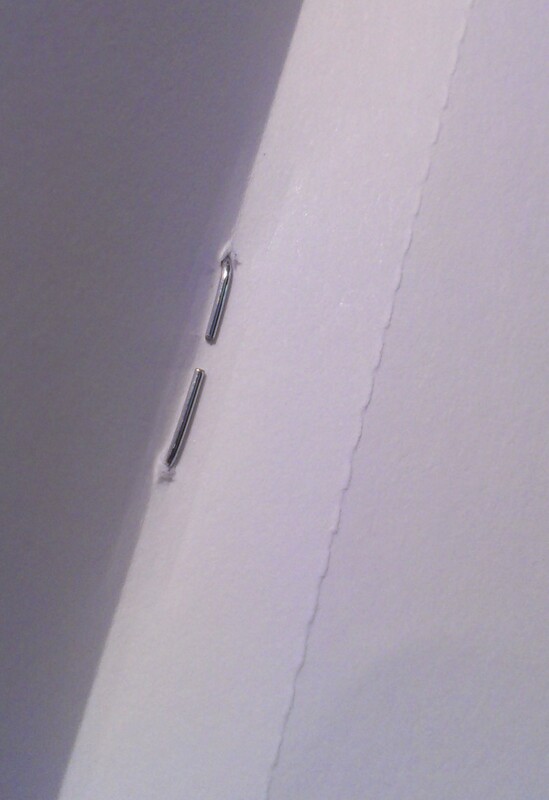 I was pleasantly surprised at the quality and enjoyability of the Staples brand paper. I found the coverstock to be more pleasant than some of the other cardstock I’ve used for hedgehogs. All papers were listed as acid free on the package. This entry was posted in Uncategorized and tagged graph, ink, notebook, paper, staples, test on 20071022 by leslie. Earlier this year I went to Maine to visit my family and take a brief vacation from work. I had made a sketchbook filled with 140lb 100% cotton paper. It was awesome to work with, the combination of the paper and the handmade book made it easy to draw what I wanted to and add the color I wanted. See below for few pictures of the book. This entry was posted in Uncategorized and tagged art, bookbinding, drawing, handmade, paper, sketchbook, watercolor on 20071021 by leslie.